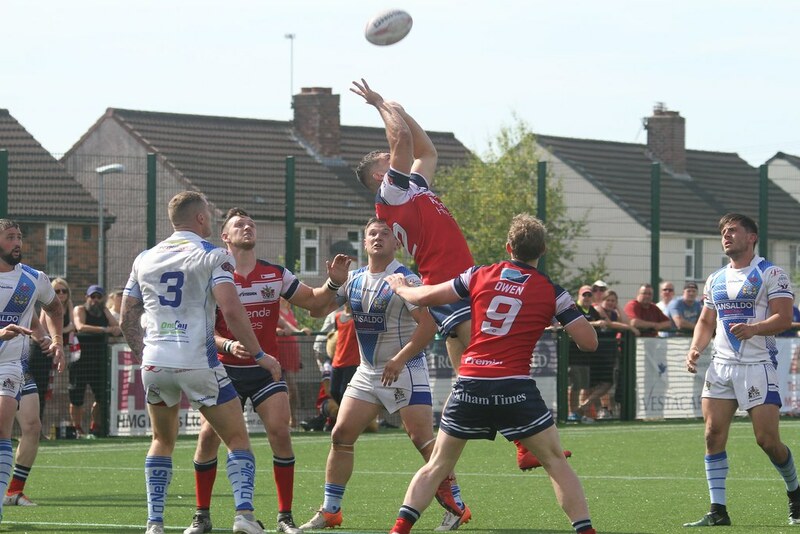 A LATE fightback that earned tries for Ben West and Kyran Johnson and one conversion by Paul Crook gave Workington a mighty scare at the Vestacare Stadium, but it wasn’t quite enough to avoid a second-in-a-row Betfred League 1 defeat for injury-hit Oldham. 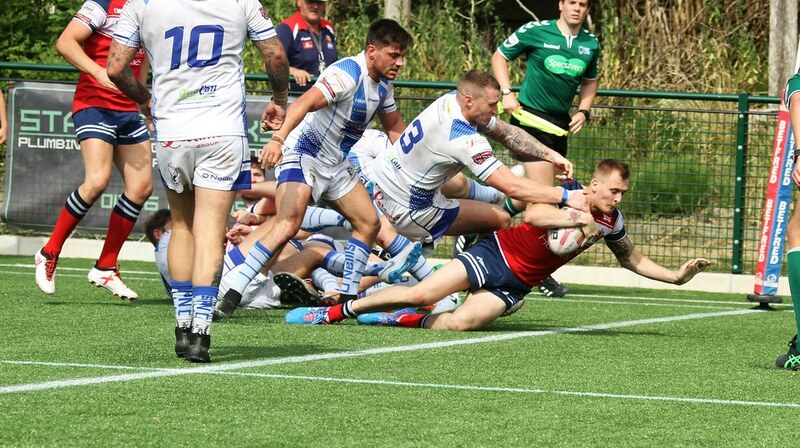 Town avenged our 32-10 win at Derwent Park in April by squeezing home 16-14 to become the third League 1 side to topple us on our own ground, following narrow wins for York City Knights and Hunslet. We’ve lost five in total — three at home, two away — but of those five all but one were by eight points or fewer and two were by the equivalent of one goal. Goals, or shortage of same, played a relevant part in the outcome of this game, given that Crook managed only one from three attempts, while Town missed four in the first-half — a conversion and three penalties. Carl Forber was off the mark twice and there were more first-half misses for dual-reg Sam Wood and clever Town stand-off Jamie Doran. Oldham, coincidentally, chose not to go for goal three times from kickable penalties, decisions they may have rued when the shrill blast of the hooter confirmed Town’s triumph by a margin of two points. 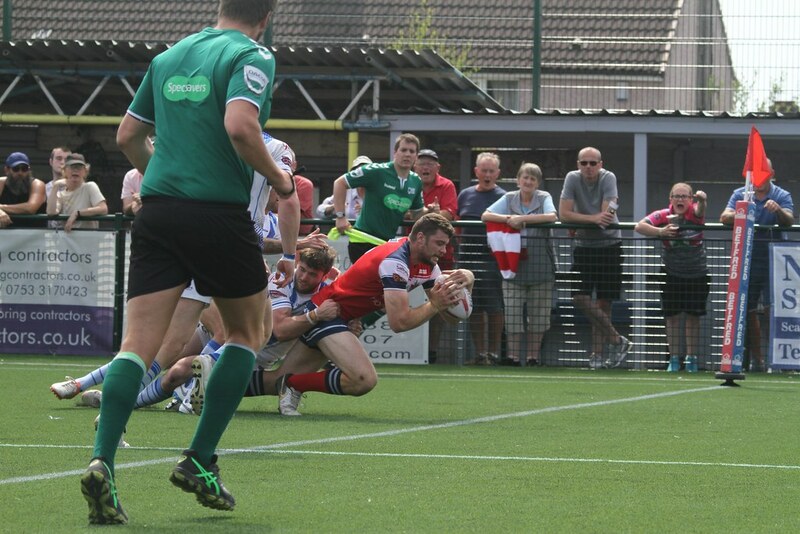 Town led 10-4 at half-time and then went out to 16-4 before the plucky Roughyeds set about the revival job. It ended on the very last play of the game when West looked to be scoring in the left-hand corner until his opposite number knocked the ball from his grasp and into touch. It was as close — and exciting — as that. 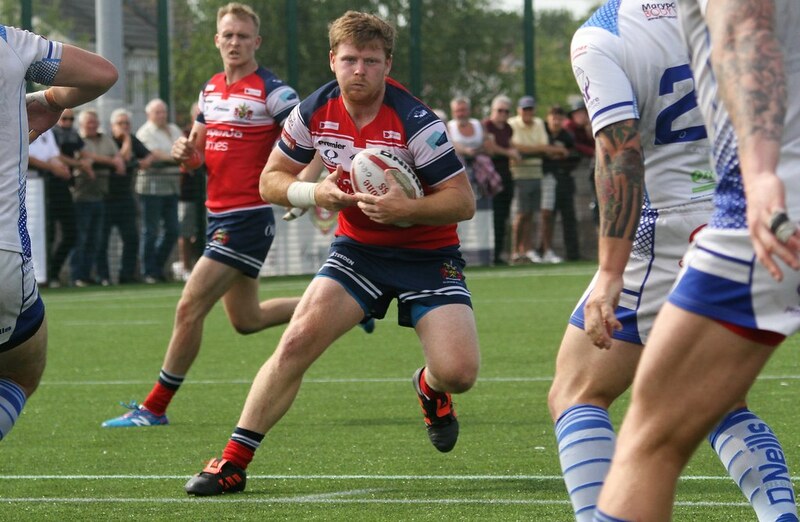 Roughyeds, hit by injuries in a narrow 16-12 defeat at Hunslet the week before, were again on Lady Luck’s receiving end in this game when they lost Danny Bridge and Matty Wilkinson, each with knocks to the head, early in the second half. They could take no further part after each failing on-the-field assessments (part of the RFL’s protocol for head injuries). On one of the hottest days of the years this severely restricted the use of subs in the second half and meant extra game time for some as both teams battled against soaring temperatures. Town also had injuries to contend with and, amazingly, both Liam Bent (Oldham) and Steve Scholey (Town) played the full 80 minutes in the tense, physical battles up front where the confrontation was at its fiercest. 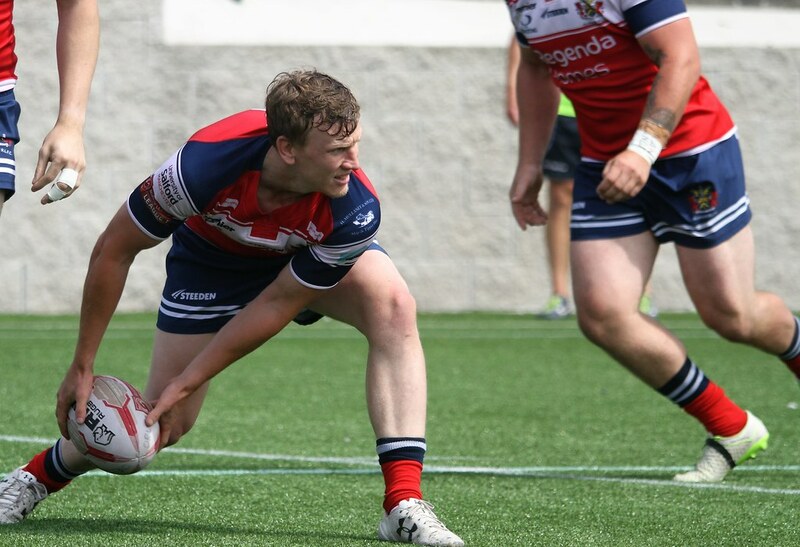 Full-back Kyran Johnson, centres Matt Reid and Zack McComb and forwards Jack Spencer, Craig Briscoe, Adam Jones and Luke Nelmes also had big games for Roughyeds. It was tense, torrid and tenacious as both sides clashed in a physical battle that left the water carriers and medical personnel of both sides working overtime from their respective benches. Each side had to contend with a yellow card, West going towards the end of the first half for allegedly interfering with Town’s quick 20-metre restart and Fuifui Moimoi heading in the same direction near the end for a high tackle on West. 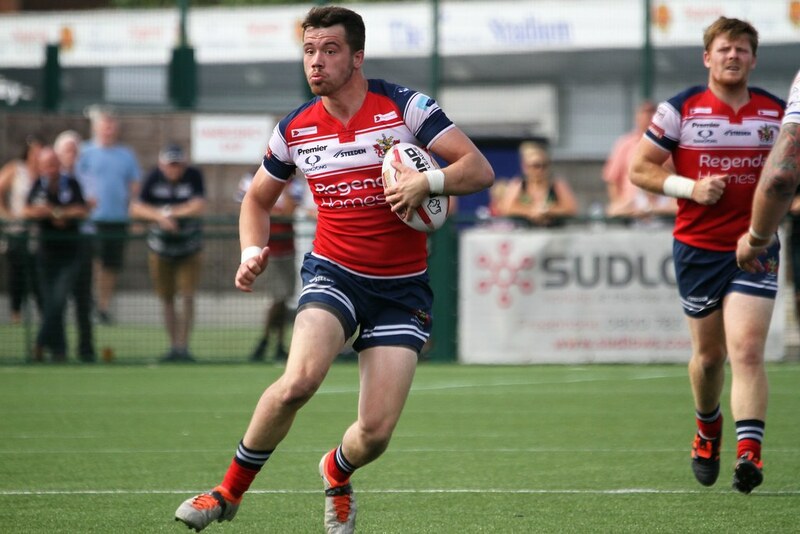 Both sides defended and grafted with remarkable resilience, considering the heat, and Roughyeds were indebted to Johnson’s bravery and tackling at the back on more than one occasion. In the run-up to half-time, for instance, Town winger Hambley looked a certain scorer as he flew for the corner with the visitors already 10-4 up, but Johnson came from nowhere to bundle him into the corner with a tremendous cover tackle. Oldham began the game in the ascendancy and were rewarded when, after putting the visitors under intense pressure for the first 13 minutes, Reid crashed over wide out on Bridge’s final pass. Crook couldn’t convert, the ball passing narrowly wide of the far upright. Town hit back with three unanswered tries, all the result of Jamie Doran’s excellent kicking game, and including two in two minutes midway through the first half. Ben Morris opened their account when touching down a grubber kick close to the line. Forber goaled for a 6-4 lead. Almost immediately, Doran hoisted a bomb which Elliot Miller took superbly in a Johnson challenge to go on and score. Leading 10-4 at half-time, Town increased their lead early in the second half when Hambley crossed in the corner, again on one of Doran’s slide-rule kicks behind the defensive line. This time Wood goaled off the touchline and Oldham had it all to do, 12 points in arrears. They made a mighty fist of it despite their injury problems, West scoring in the corner after great work by Johnson and Reid and then Johnson himself going over after more good work by the big left-centre. Crook’s goal from wide out cut the Town lead to two points with quarter of an hour left and it was game on. It was nearly all Oldham after that yet they were unable to score again, the result of some weary-looking execution at times and a determined backs-to-the-wall fight by Town, especially when they were down to 12 men with Moimoi in the bin. Town — goals, Forber (1), Wood (1); tries, Morris, Miller, Hambley. Oldham: Johnson; Eccleston, McComb, Reid, West; Crook, Hewitt; Joy, Owen, Spencer, Bridge, Briscoe, Bent. Subs: Wilkinson, Jones, Nelmes, Rasool. Workington: Miller; Hambley, Wood, K Maudling, Patrick; Doran, Forber; Wilkes, Penkywicz, Curwen, Moore, Morris, Scholey. Subs: Newton, Dawson, Rooke, Moimoi. Referee: Tom Crashley; Att: 486. How the Roughyeds’ coaching team viewed it . . .